1. 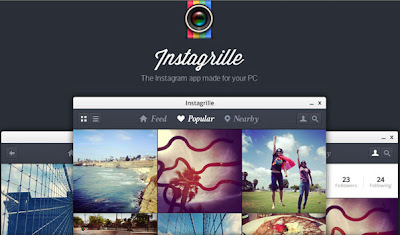 Instagrille - is very nice app that lays your Instagram photos in Grid which interface is similar to Instagram app so familiarity would not be a problem. 2. Webstagram - is a web app but not as appealing as Instagrille. The good thing about being a web viewer is that no installation needed. I recommended this one if you want to use desktop viewer temporarily. There are other apps in the web that serve the same purpose but these two are the one I tested so far. You happen to know that works for you, please share at the comments section.